Mental health is still a subject many people struggle to discuss openly. 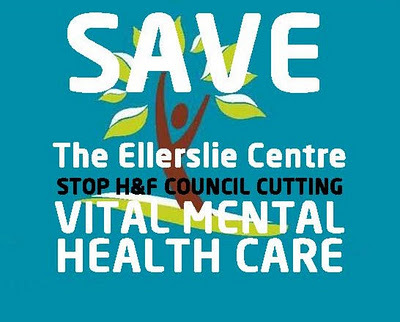 Last year, users of the Ellerslie Centre lobbied and educated councillors (of all parties) about their respective conditions and fears of how the imminent cuts to their centre would curtail critical support. The Conservative Administration went ahead with the £290,000 budget cut. It restricted the users to the top floor instead of the whole building they had previously enjoyed, it closed the canteen and laid off their support workers. Last week, at the Borough’s Housing Health and Adult Social Care Select Committee, we examined what the Administration says has been the consequences of all this. You can take a look at the Administration’s report on page 51. Rather predictably it says it has been a “success.” Echoing David Cameron’s Big Society we were informed how “the service has changed in that it no longer provides meals but encourages service users to cook for themselves.” Officials detailed how a higher than average “eight service users have been admitted to hospital since the service has changed” but they had investigated this and they knew for certain that there was “no clear evidence that [the] change in day services impacted on or caused these hospital episodes.” And just in case anyone wanted to ask what lay underneath this gloss, there was no detail of any reliable source. All of this made for a pretty grim meeting - although not for two Conservative councillors representing Fulham Reach ward who laughed and giggled throughout a significant part of the official's evidence. Last year the users of the Ellerslie Centre told how people suffering from a mental health issue can find the essential day-to-day aspects of life too difficult. Things such as eating, or eating properly, washing and doing laundry can all seem too hard to contemplate. I visited the Ellerslie Centre on a couple of occasions. Hot food was on offer, laundry was done but most importantly there was a powerful sense of caring and friendship amongst the users and the staff. That’s not something that would show in any set of accounts but was a real asset all the same. I understand the need to maximise the Council’s budget. But this Conservative Administration has been exposed for wasting millions of pounds. It’s spending nearly £1m defending its plans to demolish Shepherds Bush market, it’s gifting £70m worth of land to get unnecessary new offices for Town Hall bureaucrats, and it’s given Conservative councillors record salary rises and even paid for them to make luxury trips to the French Riviera. I find it hard to believe that this £290,000 cut to these particular mental health services were such a key priority when there is so much disgraceful waste that should have been prioritised for the axe.